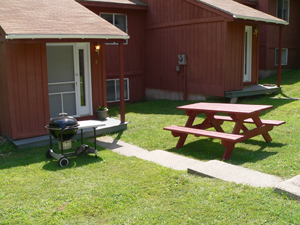 We have different styles and sizes of units available to all. 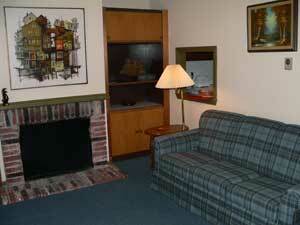 The units are furnished, including kitchen facilities (tableware, flatware, cooking utensils, etc. ), towels, bedding and TV. The Aspen, Innsbrook, St. Moritz, and Matterhorn units all have kitchenette units while the condo units have a full sized kitchen. 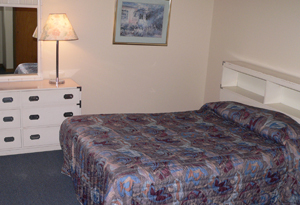 Aspen Units: These are efficiency units that include a sofa bed with a Murphy bed. These units sleep a maximum of 4 between adults and children. Innsbrook Units: These units feature a private loft bedroom with a Queen sized bed at the top of cast iron spiral stairs. With two sofa beds, these units sleep a maximum of 6 between adults and children. St. Moritz Units: Side-by-side unit. On one side, there is a King sized bed with a private bathroom. Through the connecting door, there are two pull-out sofas with another private bathroom. This unit sleeps a maximum of 6 between adults and children. Matterhorn Units: These charming units are laid out on three floors connected with spiral staircases. The units sleep 8 starting with a King sized master bedroom and private bath. The second floor contains two sofa beds and another private bath. The third floor has a loft bedroom with a Queen sized bed. This unit has a maximum occupancy of 8 between adults and children. Two Bedroom Condos: These condos are private villas with two bedrooms and a sofa bed, sleeping 6 between adults and children. 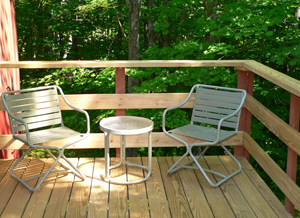 You’ll also enjoy a deck, living room, dining room and full size kitchen as your home away from home. 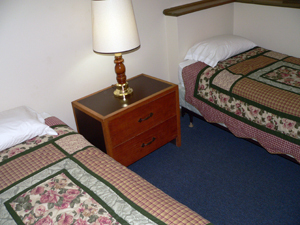 One bedroom has a King sized bed, the other has two Twin beds. Three Bedroom Condos: The three bedroom condos have all the luxuries of the two bedroom condos but sleep 8 between adults and children. One bedroom has a King sized bed, the second has two Twin beds, and the third has a Queen sized bed. Downstairs, there is a full private bath and upstairs, there is a private half bath.